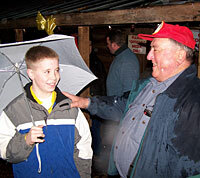 GENERAL BEAU LEE PREDICTS EARLY SPRING! LILBURN, GEORGIA, Feb. 2, 2005 /SUNRISE - General Beau Lee, Ph.D., Georgia’s Official Weather Prognosticator and internationally recognized furry forecaster, braved a dismal drizzle and nearly freezing breezes to exit his newly-renovated Weathering Heights Mansion just after sunrise at The Yellow River Game Ranch in Lilburn, Georgia, a 24-acre animal preserve. Beau has a girlfriend! Shortly after Beau stepped outside his Weathering Heights mansion to search for his shadow, the nose of a second groundhog was seen peaking from the front door. According to Art Rilling, Beau and "Dixie" are getting along well. 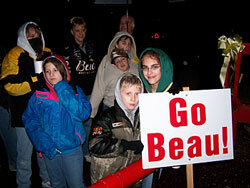 Photos: Top right, the crowd gathers in anticipation of Beau's appearance. Middle left, Game Ranch CEO Art Rilling greets VIP bellringer Christopher Allen. Lower right, Gwinnett County Commissioner Mike Beaudreau announces Beau's prediction. Bottom, Dixie sneaks a peak out the front door. About the Game Ranch: The Yellow River Game Ranch, Georgia’s oldest animal preserve, is now celebrating its 43rd year of introducing people-friendly wildlife to children and adults. The Game Ranch is open seven days a week, 9:30 am to 6:00 pm. The Yellow River Game Ranch site is developed and hosted by Shoestring Solutions. You can have one, too! Contact us.